I don’t know about you, but I’m over all this yucky cold weather and ready for some sunshine and warmth. Luckily for me, we’ve had some very nice spring-ish weather the past couple days here in Atlanta. Not so lucky for me, I’m in the middle of tax season. Boo! During the fall and winter, all I want to do is curl up in bed and eat lots of hearty comforting food. Once it starts warming up, I start craving lighter, healthier fare. And believe me, I need to start craving some healthy food, based on the latest scary viewing of the scale. When Susan asked me if I wanted to participate in a Dreamfields Virtual Dinner Party, I was more than happy to say yes. Since it’s National Nutrition Month, the focus was on healthy recipes with lots of fiber. Dreamfields pasta already contains 5 grams of fiber and 7 grams of protein per serving, so we were already off to a healthy start! One of my “tricks” when I’m eating pasta is to add veggies to it to bulk up my serving so that I feel like I’m eating more — I’m a visual as well as a volume eater, so this is a win-win for me. 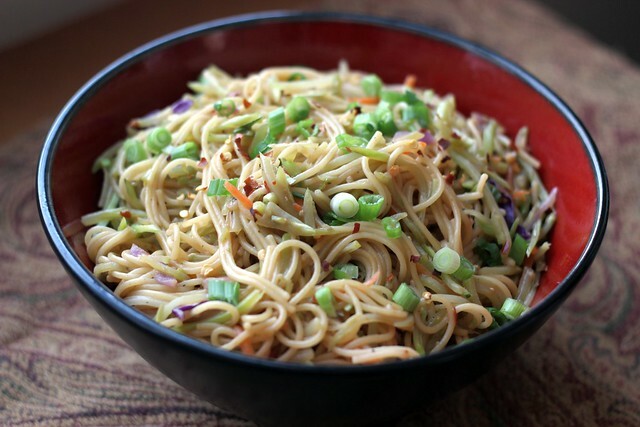 These Fiery Confetti Noodles combine angel hair pasta with broccoli slaw with a spicy Asian sauce containing 3 types of pepper and chili oil. You can eat them as a warm noodle salad, or add cooked tofu, chicken, shrimp, etc. 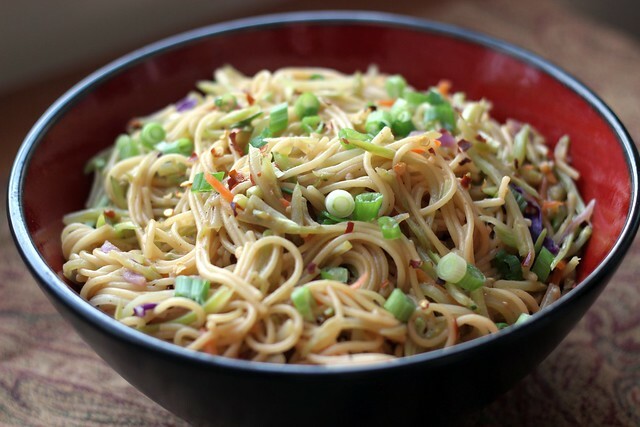 for a lighter version of lo mein. The best thing of all is that this probably takes between 10-15 minutes to prepare, so it’s a great choice for a weeknight dinner. Feeling inspired to create your own healthy pasta dish? I’m giving away an entire case of Dreamfields pasta to one lucky Spice’s Bites reader, which should give you plenty to play with! 1. Visit the Dreamfields website, then come back here and leave a comment telling me what cut of pasta is your favorite and why. 5. Tweet about this giveaway, making sure to use the hashtag #HealthyPastaMonth. You can do this once per day. Giveaway is limited to U.S. residents age 18 and over. Giveaway runs from Monday, March 10th, 2014 through 9pm EST Friday, March 14th, 2014. Once I’ve selected a winner, I will email you to get your contact info, so make sure you enter an email address when leaving a comment (it won’t show up in the comment). 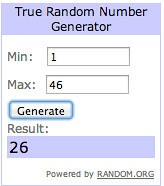 Winner has 48 hours to reply or else I will have to select another winner. *Disclosure: Dreamfields sent me several types of their pasta to play with. This is a sponsored post, however, any thoughts or opinions are my own. Dreamfields is providing the prize for the winner of the giveaway. Bring large pot of water to a boil on high heat. Add dry pasta and broccoli slaw. Cook for 5 minutes or until pasta is tender. Drain and return pasta and broccoli slaw to pot. Add sauce ingredients and mix to coat pasta and broccoli slaw thoroughly. I would say that I really like Elbow Pasta. There are so many ways to use this type of pasta, in soups, pasta salads, with tomato sauce, etc. But I do love all types of pasta. Elbow pasta is our favorite in mac and cheese and macaroni salad. When making mac and cheese I use the fat free half and half. I also use light mayo in my macaroni salad with lots of veggies. I like angel hair pasta because it’s light and delicious. I like Rotini for my meals. I love Angel Hair pasta the best. I love the texture of it! I always add extra vegetables to every pasta dish that I make. Spinach and Broccoli are great vegetables to add. I love to use linguini pasta, my favorite dish is linguini in clam sauce red or white…. I follow on Facebook and Pinterest. I do not have accounts for Twitter or Instagram. I follow Spice’s Bites on Facebook. I do not have a Twitter account. I like them all but linguini is my favorite. I like linguini with broccoli and cheese and extra virgin olive oil. I like spaghetti! It seems everyone in my family including grandchildren like this pasta. it’s fun! I can make it as a hot meal or a cold meal, I love spaghetti! I have used all styles of Dreamfields, but my favorites are Angle hair and macaroni of which I make my famous mac & cheese, requested by my family all the time…thank you for making a wonderful low garb product. Fan for life. My favorite cut pasta is the linguine. I like the flatness and width and it’s great with creamy sauces such as a chicken dish with spinach and Parmesan that I like to cook and also it’s great with the clam sauce. I mentioned the chicken dish that like to make. Adding a lot of spinach to the dish gives it more nutrition and I also have onions and garlic in the dish. I follow Dreamfields on facebook, twitter and pinterest. I’m not able to on instagram since I don’t have a smartphone. I follow you, Spices Bites, on facebook and twitter. I make my pasta dishes healthier by adding tomatoes, olive oil and lots of vegetables, & herbs but not too much salt. To make my pasta dishes healthier I try to just use a little olive oil and some of the pasta water for sauce. Also roast grape tomatoes and other vegetables and add those to dish. I like the Penne Rigate simply because it is the type of pasta I seem to use the most of — it is pretty versatile! I love the angel hair but I wish they would make shells. That would be so good.